I want to support Hillary but she simply does not have the communication style that is needed for today’s world. Yesterday on Meet the Press, and last week on Hardball and Bill Maher they focused on her tendency to give nuanced answers. It just doesn’t work in a world of too much noise. THE PRICE OF AND, AND, AND. Hillary’s approach to communication is not suited for today. WHAT IS NUANCE FOR, WHEN NO ONE LISTENS ANY MORE? Trump has punched his way to the top through the use of one key element: simplicity. Bernie Sanders has followed in his footsteps. But Hillary still hasn’t quite figured it out. Trump had it nailed from the outset with his simple moronic narrative slogan “Make America Great Again.” Bernie has had an equally simple message all along which he boiled down to one line last week. Here is Chuck Todd quoting his line yesterday on Meet The Press. HILLARY CLINTON: I think it’s kind of an extreme statement that once you take a hard look at it is hard to understand. When we talk about Wall Street are we talking about every bank or are we talking about a particular part of New York? That’s never really clarified. What I believe is that there are good actors and bad actors, actors in every part of our economy. That exchange is a sad portrait of what I’m afraid the future holds for Hillary. She just doesn’t get it when it comes to concision. That’s why she has had no slogan to her campaign. I wish today’s world was as decent and intelligent and thoughtful and listening as the world for which she is designed. But it’s not. Look at what Sanders said — that Wall Street is built on fraud. Is that not the broad sentiment of today? Is that not the core message of the movie “The Big Short” that is about to clean up at the Oscars? Yes, I know the situation is more nuanced than that, but when it comes to mass communication nuance is death, unless you’re going to put together an entire detailed communications campaign that is structured around conveying nuance. Which is not impossible, but it takes more effort than just throwing all the details out using the “and and and” (AAA) form. Hillary is going to get whomped tomorrow night in New Hampshire. She essentially got whomped last week in Iowa despite “winning.” Regardless of the actual politics of what she stands for I’m afraid her approach to communication is more suited to the 1970’s than today. A final sad comment on Hillary. 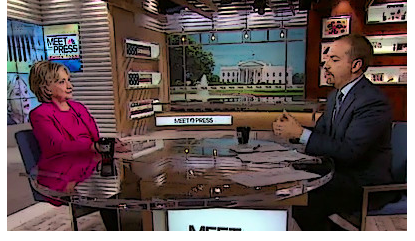 Chuck Todd confronted her about Madeline Albright’s semi-humorous statement last week that there is a special place in hell for women who don’t support women candidates. Hillary should have embraced that statement firmly saying that’s right, it’s time for a woman in the presidency. But instead she backpedaled, dismissed it to some extent as “that’s just Madeline” and passed up yet another opportunity for simplicity in her messaging. It is time for a woman president, she ought to be the one, and she should just take a chance and go with the gender element. But she’s not. I’m guessing it’s because of some polling data she’s following.